In this post, you’ll find some ideas about what to do during a weekend in Zurich, if you were unlucky and the weather forecast promises nothing but rain. Do you want to know how expensive is Zurich? Check our new Tripsget app for iPhone. It will tell you exactly how much money you will need in Zurich based on YOUR travel habits! Try it for free now or read more about Tripsget in this post. What to expect from Zurich? How many days are enough in Zurich? In total, we spent in Zurich around 3 days (2 full days and half a day). As our trip was in May, I expected some really nice weather, but we were unlucky and not only it was super cold (+12), but also it was raining all the weekend. Despite the fact that we only saw a grey city in the grey tones (grey sky, huge rain clouds and so on), Zurich still looked very nice. Zurich is neither small nor big, so I think 3-4 days are perfect for Zurich. In case you’re doing a road trip around Switzerland, you will probably need a bit less time in Zurich – 2 to 3 days. Zurich has its own atmosphere: the feeling of money, wealth and tranquillity is in the air. When you walk through the streets of Zurich, you feel like this city doesn’t know any problems there are in the world. Is it good or bad? I don’t know. We stayed in the apartments Swiss Star Aussersihl, which we booked through Booking.com. Actually, the apartment was really nice (it was really surprising because the price was fairly low) and located just 15-20 minute walk away from the city centre. It had a kitchenette, so it was possible to cook, and all the necessary cutlery. Only the teapot was missing. 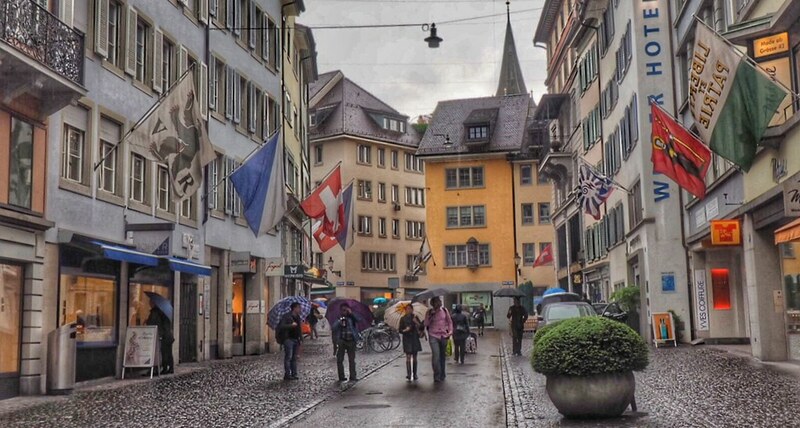 On the day of our arrival, despite the rain, we were able to walk around the city centre a little bit before heading to a very nice traditional Swiss restaurant: Swiss Chuchi. It was Pepe’s birthday, so we had a real feast: Cheese Fondue and Raclette. Cheese overload 100%! Never mind, it can never be too much cheese. What to try in Zurich? Cheese Fondue is basically a pot with melted cheese, set over a candle or a tiny gas-burner, accompanied by tons of bread, which you’re supposed to dip in the cheese. Yummy! Raclette is another typical Swiss dish: melted cheese with some boiled potatoes and bacon/beef/pork/chicken and some pickles. The trick is that you melt the cheese yourself as well as fry the bacon (or another kind of meat) in the special Raclette grill, which is set up on your table. After the dinner, we were so full, that we couldn’t even go to any of these nice bars and lounges located in the city centre of Zurich (that was definitely good for our budget). Rainy Zurich: what to do? Unfortunately, the next day wasn’t any better in terms of weather, so we couldn’t even hire the famous free bikes of Zurich (the office is located next to the Main Railway station). Instead, we walked through the city centre again, visited some shops (they still work on Saturday, but most of the shops don’t work on Sunday and, surprisingly, many restaurants don’t work on Sunday either, so if you’re planning to eat out in the evening, it makes sense to book a table in ADVANCE(!)) Otherwise, you’ll end up figuring out what to do in Zurich. Lunch place suggestion: Zeughauskeller. If you’re looking for a place with massive long tables (aka German breweries in the middle of Munich etc) with sausages (Bratwurst), you’ll enjoy your meal here. A standard Bratwurst costs around 19 Swiss Franks and a 1/2 l beer is around 6.5-7 Swiss Franks. A lot more expensive than in Germany, but deal with it, you’re in Switzerland. Later the weather got a tiny bit better and we headed to the famous Zurich Lake. We couldn’t walk around it as well as take a boat ride (it wasn’t possible due to the high water level, the rain was to blame). Actually, the boat ride is one of the most famous things to do in Zurich. We were actually thinking: what to do in Zurich and then we decided…. …we decided to go to the Spa (Thermalbad & Spa) on foot and at the same time see the city a bit more. We walked past the FIFA museum and it looked really appealing, but we resisted and ended up relaxing in the spa. Unfortunately, it wasn’t possible to take photos inside and all the cameras/phones and so on, had to be located in the locker, so I cannot really show you how amazing this SPA was, but I’ll try to use words instead. The Thermalbad & Spa has 3 floors (on the ground floor is the reception and changing rooms plus lockers, on the 1st floor there are the saunas and 4 pools and on the last floor there is the cafe and the fabulous outdoor thermal swimming pool with the panoramic view over the entire Zurich). Despite the fact that everything was really crowded, the experience was very enjoyable and romantic. The spa was full of couples, so I guess it’s the number one couple destination in Zurich. On Sunday, the weather finally got better, but I had an issue with my foot and had to go to the emergency clinic next to the Main Railway Station. The doctors weren’t really useful (I was properly treated when I returned home on Monday) but with this pain, it wasn’t possible to walk. So we met my friend for a burger & beer in a nice hipster budget bar and went back to the apartments. Heading to Zurich? Why not check out these paper guides? Liked this post about a weekend in Zurich? Save it for the future on Pinterest! Disclaimer: this post contains affiliate links. It means we get a small commission if you buy something using these links at no extra cost for you. We use these commissions to get this website going. Such a shame you got bad weather in Zurich, for me it was the other way around, bad weather in everywhere else I visited in Switzerland except for Zurich so I really liked it. Good to know about the spa, thanks! Thanks for the comment 🙂 Great that you enjoyed Zurich!